The stock market is on fire right now. Year-to-date, the S&P 500 is up 16%, and it isn’t even May yet. While I’ve been bullish on this 2019 stock market turnaround for some time now, I also realize that there are still risks out there which could subdue the current rally in stocks. U.S. and China trade talks are progressing, but there’s no resolution yet. The global economy remains healthy, but it is slowing. Consumer confidence remains high, but it is dipping. Earnings remain strong, but costs are rising, margins are dropping and earnings growth is slowing. Overall, the current economic backdrop for stocks is bullish, but it has risks. Right now, valuations seem to reflect reality. Thus, the outlook for continued gradual gains is healthy. But with stocks set to slow, now is a good time to start buying into dividend stocks. These stocks tend to outperform when the broader stock market slows since they are seen as protection from volatility. Further, dividend stocks could get a nice boost in 2019 if the Fed remains cautious, doesn’t hike, and rates largely remain low. Overall, now seems like a good time to add some stability to the portfolio through dividend stocks. With that in mind, here’s a list of seven healthy dividend stocks to buy in 2019. Telecom giant AT&T (NYSE:T) has been burdened by a huge and growing debt load, and slowing operations in its core wire-line businesses. 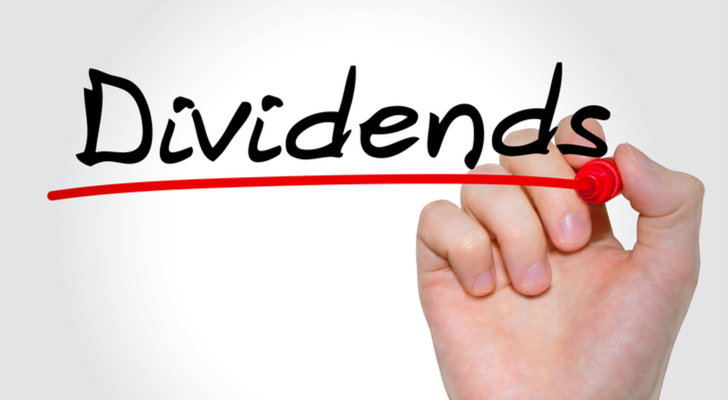 AT&T stock remains at an attractive entry point for dividend investors. The dividend yield is 6.37%. That’s near a five-year high. The forward earnings multiple is 8.8. That’s near a five-year low. In other words, around $32, AT&T stock is cheap. It won’t remain cheap for long. More aggressive pushes into the streaming market will ultimately offset cord-cutting weakness, and the mainstream deployment of 5G coverage in 2019 will help boost profits in the wireless business. Overall, the fundamentals will stabilize in 2019, and once they do, AT&T stock will rally in a big way. With a mere 2.35% dividend yield, Intel (NASDAQ:INTC) may seem like a surprise entry on this list. But, you don’t buy Intel stock for the yield. You buy Intel stock for growth at a reasonable price and you get a 2.35% yield on top of that. At its core, Intel stock is the cheapest and most stable way for investors to gain exposure to all of tomorrow’s most relevant growth markets. You name it, Intel has exposure to it through its portfolio of chips. Data-centers? Intel is the biggest supplier. Internet-of-Things? Intel has a huge presence there. AI? Intel is at the front of that innovation frontier. Autonomous driving? Intel has scored multiple self-driving partnerships. Overall, Intel stock has a ton of long-term growth potential through its multi-faceted exposure to multiple secular growth markets. Yet, the valuation today remains exceptionally reasonable, at just 11.4 earnings. Thus, Intel stock is big growth at a reasonable price, and there’s a 2.35% yield to boost investor returns. Much like Intel, Target (NYSE:TGT) is a typical growth at a reasonable price stock. But, it’s also a strong dividend stock, with a dividend yield that currently sits just under 3.2%. Thus, with Target stock, investors get the best of both the growth and stability worlds. The fundamentals are currently favorable for Target stock. The U.S. consumer remains largely healthy. There has been some weakness in the consumer with rising rates and stock market volatility, but such weakness hasn’t been enough to derail the consumer. Moreover, Target has been on fire in terms of building out omnichannel commerce initiatives and expanding its product portfolio. The combination of these efforts has made Target one of the hottest stories in the entire retail world. Target stock trades at just 13.4 forward earnings with a near 3.2% yield. Thus, the stock is cheap against a favorable operating backdrop. That combination will ultimately lead to Target stock becoming a winner in 2019. On more of the pure dividend play side is utility giant American Electric Power (NYSE:AEP). When it comes to the fundamentals, you won’t find many stocks supported by more stable fundamentals than AEP. American Electric Power is a massive electric utility company that delivers electricity to more than 5 million customers across eleven states. Demand for electric service is much like demand for water — it’s not away any time soon, regardless of which way the economy swings. As such, the demand drivers here are stable, as are the company’s revenues and profits. Meanwhile, AEP stock sports a 3.2% dividend yield. With rates on hold, that yield is more attractive today than it was a few months ago, when the Federal Reserve was consistently hiking rates. Thus, so long as the Fed remains on hold in 2019, AEP stock should outperform as dividend stocks come back in favor. Although Disney (NYSE:DIS) isn’t a utility company like American Electric Power, it does benefit from similar stability in demand, revenues and profits. Disney doesn’t offer electric services. But, it offers other things that the consumer arguably can’t live without — the world’s greatest movies and theme parks, robust access to live sporting events, and a handful of quality TV shows and channels. Demand for these services and goods is stable in the big picture. To be sure, cord cutting is hurting the company’s traditional media business. But, even that major headwind hasn’t really depressed revenues and profits that much, and DIS stock has simply traded sideways as a result (as opposed to falling by a bunch). In 2019, that headwind will disappear with the launch of a Disney streaming service. As that headwind disappears, this stock will rally from a current valuation low that comprises a 20 forward multiple and 1.6% dividend yield. Thus, calendar 2019 could be a big breakout year for DIS stock. A highly underrated dividend stock that could have a big 2019 is Exxon Mobil (NYSE:XOM). The recovery in oil prices in early 2019 has led to a sharp recovery in shares of XOM. Many analysts expect this to continue. Global demand appears to be firming up thanks to stabilizing economic conditions. Meanwhile, the world’s major oil suppliers seem increasingly committed to synchronizing production cuts. Firming demand coupled with falling production should lead to a rally in oil prices, which in turn should lead to a rally in XOM stock. This is especially true considering the valuation underneath XOM stock today. The yield is at 4.1%. That’s a multi-year high. The forward multiple is 15. That’s near a multi-year low. As such, you have a cheap stock with improving fundamentals. That’s a winning combination that should power XOM stock higher in 2019. Very few companies have performed as consistently well as McDonald’s (NYSE:MCD) over the past several years. During that stretch, McDonald’s has reinvented itself as a consumer-friendly company more aligned with today’s healthy eating trends. They’ve subbed out frozen patties for fresh patties. They’ve added premium and healthier items to the menu. There has been a huge emphasis on quality chicken offerings. There has also been a big push into the breakfast game. And, they’ve done all this while sustaining industry-low prices and industry-high convenience. All these initiatives have powered consistently robust results at McDonald’s. Net result? MCD stock has rallied in a big way. It will continue to do so. The fundamental drivers remain healthy. The stock remains reasonably valued (22 forward earnings and a 2.45% yield). As such, MCD stock will remain on a winning trajectory for the foreseeable future. As of this writing, Luke Lango was long T, INTC, TGT and DIS. Article printed from InvestorPlace Media, https://investorplace.com/2019/04/healthy-dividend-stocks-to-buy-extra-stability/.